This is the same as #600. I made some awful merge/commit errors there. Opening a new PR seemed cleaner and easier. OGGM glaciers are initialised with current (~2003) glacier geometry and modeled as entities. For all scenarios with glacier retreat or only small advances this is perfectly fine. But for simulations where glaciers advance significantly nearby glaciers might merge together and behave different then when modeled individually. The first requirement to tackle this issue was solved with #539, as each Flowline got an individual mu*. This Pull Request will most likely only deal with individual glaciers and their tributary glaciers. Future work could adapt this approach and apply it to regional scales. But I doubt merging glaciers will ever become a fully automated process within all OGGM simulations. More likely merging glaciers will be a deliberate choice for specific simulations. intersect_downstream_lines finds tributary glaciers to a main glacier by intersecting downstream lines. This will separate true tributaries from ones flowing into other valleys. merge_tributary_flowlines will merge the model_flowlines of the tributary glaciers with the ones of the main glacier. The result is one glacier containing all tributary flowlines. One necessary addition in the process was to add a Centerline.climatefile attribute. This allows to use a different climate file for each individual flowline, as tributary glaciers might likely use a different climate reference file than the main glacier one. This PR is still work in progress. I at least want to add a more automatic selection of possible tributary glaciers. But I am happy to take comments or suggestions! For illustration a simulation with artificial climate around Hintereisferner: For the first run all 5 pictured glaciers (Hintereisferner, two small previously connected pieces, Kesselwandferner in the north and Hochjochferner in the east) are modeled in basic OGGM fashion as entities. The second plot shows a merged run, where all flowlines of the other 4 glaciers are merged to Hintereisferner. Note how the upper part of the glaciers are identical in depth and width, but the lower part of the merged glacier is thicker, wider and further advanced as there is now more mass contributing to it. 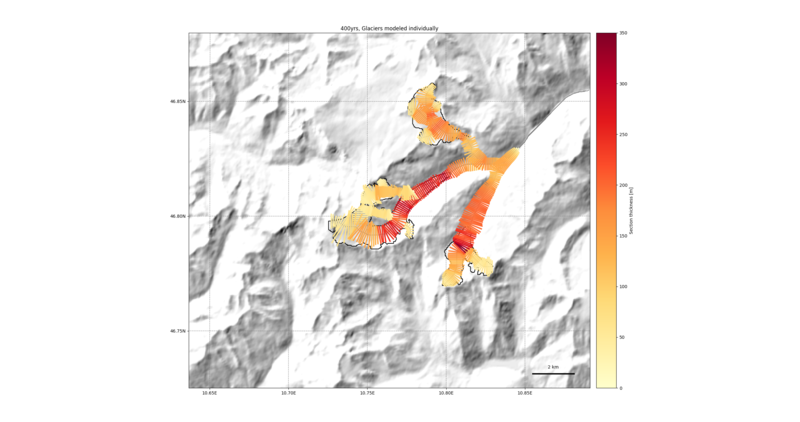 write a small function gis.merged_glacier_masks, adapted from the original glacier_masks which provides glacier outlines to the graphics functions. For this I need to merge the outlines of the tributary glaciers and combine them in one shp-file. Hello @matthiasdusch! Thanks for updating the PR. There are no PEP8 issues in the file oggm/core/centerlines.py ! There are no PEP8 issues in the file oggm/core/flowline.py ! There are no PEP8 issues in the file oggm/core/massbalance.py ! There are no PEP8 issues in the file oggm/graphics.py ! There are no PEP8 issues in the file oggm/utils/_workflow.py ! There are no PEP8 issues in the file oggm/workflow.py ! I have the feeling some parts could be simplified, but I don't think it's necessary for now: if it works, that good! Please double check the docstrings and the part about the possible duplication in code again. I'm sorry I created a conflict again, hopefully this can be solved online this time. Let me know before you want to merge, I might have another look. Well I agree mutilating the existing Centerline is not very pretty. But to initialize a new one, I think we would either have to use some manipulated glacier geometries or copy, adapt and redo the whole centerline processes. Both seems more error prone to me than cutting the line where we know it was initialized for a working glacier. But I am happy to discuss and change this later on. I trust your judgement here! mbbias = 0.0 # necessary? I now implemented the local_mustar files to be copied to the merged GDir. MultipleFlowlineMB can now use a different bias for each flowline if they originate from different glaciers. Intuitively I wouldn't (re)do all the preprocessing tasks here. I thought the workflow would be: 1 prepro some glaciers, 2 merge them, 3 run the merge simulation. This task should start at step 2 and assume the glaciers are preprocessed already. Yes, my initial idea was to only preprocess the none relevant glacieres as far as neccessary. Purely with performance in mind. But I agree, this bloats the workflow function. I changed this. For the unlikely case one runs into performance problems because of this, it's easier to write a dedicated workflow. I guess you are doing this to preprocess only the glaciers you really need. I can see why this is useful, but it feels quite redundant.